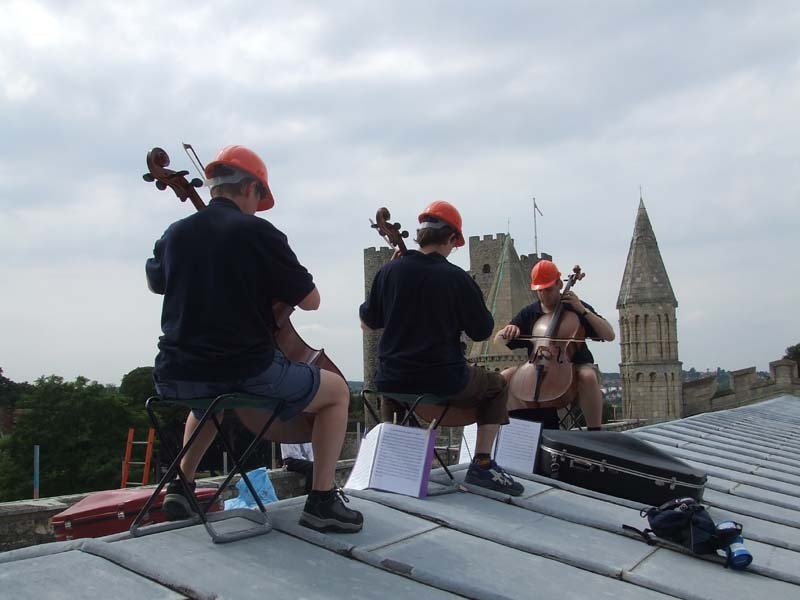 Between 24 July and 4 August 2006, we undertook our first long term challenge - the Extreme Cello Cathedral Roof Tour. During these 12 days, we visited all 42 Anglican Cathedrals in England to give a performance - mostly on the roofs*. This involved over 2400 miles of travelling (that's an average of nearly 200 miles a day), visiting almost every county in England, climbing countless stone spiral staircases, and lots of luck with the weather! In doing this we raised around £5120 for two charities - Aspire (providing rehabilitation and support to people with spinal cord injuries) and Shelter (providing practical advice and support for homeless people). Well, we’re off! After months of planning, the Extreme Cello Cathedral Roof Tour has finally begun in earnest. And a great day to kick off on - four lovely Cathedrals, plenty of miles under the belt, and glorious weather. Actually, the day got off to a slightly less auspicious start. We were due in the Radio Cornwall studios (to do an interview with BBC Radio Devon) at 7.50am, but due to a mix-up and lack of communication somewhere along the lines, they weren’t expecting us in Truroand the time of the interview got moved a couple of times! Anyway, we got on air at 8.35, talked and played a bit, and then got on to Truro Cathedral where we were met with a nice audience! 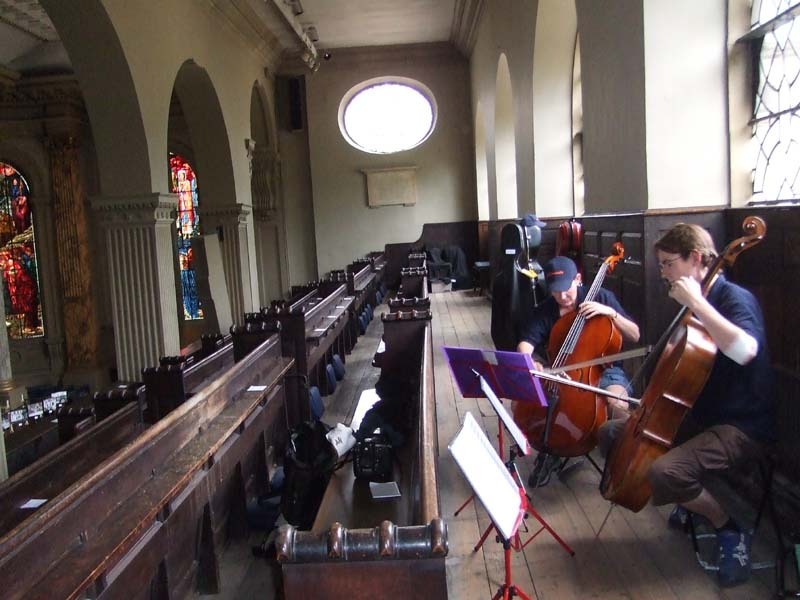 We were playing inside at Truro, due to there being no suitable roof space to play on, but the West Gallery actually made a nice place to perform from: suitably extreme and with nice acoustics! Along the A30 then to Exeter, doing another couple of radio interviews on the way (not playing this time, however, nor with the driver talking!). A quick note about our transport - we’re in a single van, a 6-seater Ford Transit (see above) with plenty of room for cellos & luggage in the back. We’ve suitably adorned it with Extreme Cello literature, as well… The three cellists (that’s Jeremy Dawson, James Rees and Clare Wallace) are taking turns driving (on a day-by-day basis), with the fourth member of our crew, Zoe Rees (our newly appointed administrator!) acting as navigator-in-chief! So far, so good with regard to the travelling - I’m sure we’ll hit some bad traffic somewhere during the 12 days, though. Exeter was our first proper roof - a small piece of roof high above the North door (see right). Playing there was fine, although it was apparently difficult to hear us from the ground below due to the other noise in the city centre. We ended up playing there for much longer than expected, owing to far greater media interest than anticipated and not enough room for them all to be on the roof at once! Our thanks go to the Clerk to the Chapter, Tony Le Riche, for administering this calmly and fairly! Up the road to Wells, where we were a little late due to some roadworks at Glastonbury. However, we played for about 15 minutes from the triforium, which gave a lovely acoustic in the nave (or so we were told). Then came one of the highlights of the day - Ed Coton, a lay clerk at Wells, invited us back to his house for refreshment, and we enjoyed a lovely half hour or so with Ed, his wife Liz, and their delightful family. Their older daughter, also a cellist, gave us a brief recital also! Finally we got to Bristol- 180 miles after starting this morning - and played in the most wonderful acoustic imaginable, the Chapter House. Although it wasn’t “extreme” in terms of the height, the age and sound of the building made it a lovely way to round off the day. We’d like to say a big thank you to Richard and Carol Heginbotham for hosting us last night, and making our first night so comfortable and relaxing! Anyway, 4 down, 38 to go… but at least we’re under way! Day two of our tour - and the reality of how much of a challenge this is setting in! First, the technical challenge - apologies for the lateness of yesterday’s blog entry; it was written in time, but due to a BT line fault at our hosts last night (Clare’s parents), it wasn’t possible to upload it until this morning (when we grabbed a quick 15 minute coffee in Hereford). Anyway, thanks to tonight’s hosts - Jenny and Geoff, friends of James and Zoe’s - we’re able to update this one in time. We’re aware that we may face similar problems down the line elsewhere, so do bear with us if an entry doesn’t appear on time! We also had some great climbing challenges. Gloucester Cathedral involved 269 steps at 7.30 in the morning - just the wake-up call we wanted! The top part of the staircase was extremely narrow too, causing a few cello-carrying problems (but we did get them up there - see above!). Similarly at Worcester , where our ascent was delayed whilst waiting for camera crews, we had to get up some pretty small (but steep) steps. However, the view from both Cathedrals was fabulous, and Clare in particular enjoyed Gloucester , the city of her childhood. We even got a live radio interview up there on BBC Radio Gloucester! In between those two we visited Hereford , which was our favourite location so far, although it did present some access challenges thanks to an ingenious trap door! We were playing in a small turret at the West end - high enough to be extreme, small enough to feel exciting (cameras had to operate from the main Cathedral roof above us), but low enough for the sound to carry to the crowds below (honestly! - well, perhaps “crowds” may be a bit strong…). Thanks to all involved for making that such a great occasion, especially to the Cathedral staff, who provided us with cold bottled water when we came down! We finished the day, after a 70 mile (or so) drive to Oxford (it felt more like 170 miles, due to the heat in the van… oh for some air conditioning! ), by playing at Christ Church Cathedral. Our only inside one of the day, this came as a welcome relief with the sun beating down outside. We played for 15 minutes or so from the Embroidery Gallery (see right), which was a comfortable location after the challenges earlier in the day. Our greatest challenge here was probably making ourselves heard above the guided tours! But we finished playing at about 4.00 pm, meaning we had a nice time for a cup of tea in Oxfordbefore heading off to our hosts’ house in Abingdon. An early start tomorrow, in order to get to Salisbury by 9.30 (followed by Winchester at 11.30, Portsmouth at 2.00 and Guildford at 4.00), so I’ll stop here now… come back soon to see what else we’ve been up to! We’re really getting into this touring business now! Day three is now complete - and we’re getting a proper feel for the different Cathedrals, and getting better at setting up and in some cases our performances are actually improving! That didn’t exactly hold true for the first stop of the day, however. 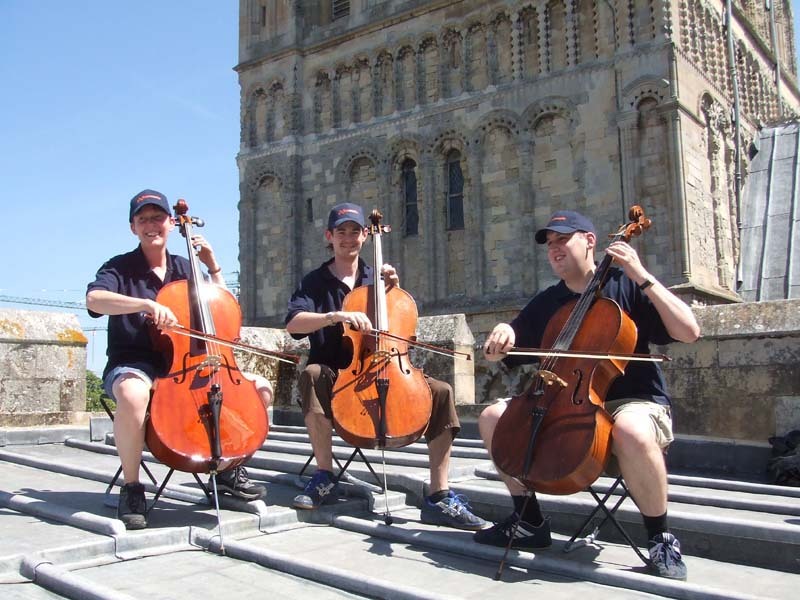 Salisbury is a fantastic Cathedral, and we got there in plenty of time so we could set up in a leisurely fashion - however, the place where we played (the West end gallery at triforium level) doesn’t leave a lot of space for playing cellos. We barely had enough room to bow, and had to set the music stands off to one side: however, we just about got through unscathed despite the tuning problems which resulted! We did get some great media coverage at Salisbury too, which always helps. 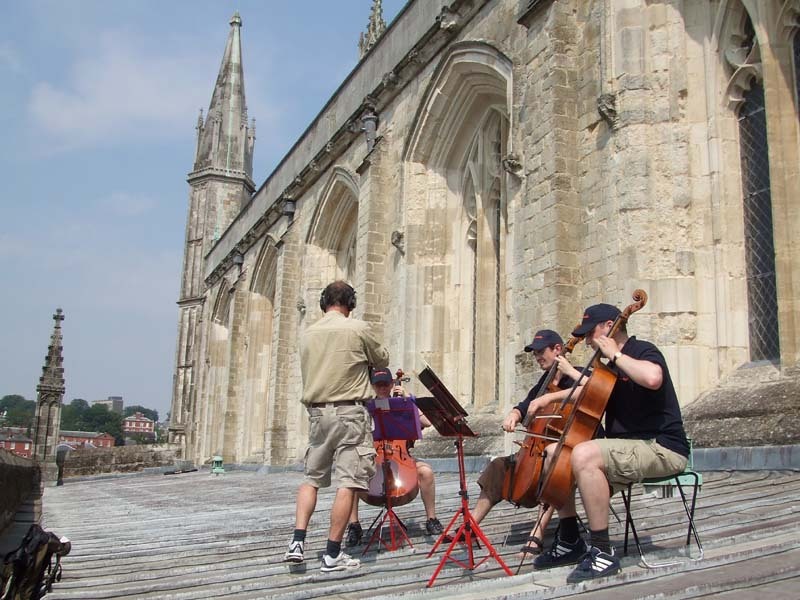 Next on to Winchester (above) , where we played on the nave roof (the staircase to the main tower is much too small for cellos to be carried up), but this meant we were audible to the gathered throngs below. Winchester was, I think, the fourth Cathedral where we were approached by a member of the public wielding the Church Times, having seen the article on the back page of last Friday’s edition. We honestly never thought it would spring this response, and we’re really glad that we’re able to play for these people! Now we're off to Lancing to stay the night with our old friend Damian Kerney (who teaches at Lancing College ) - I’m writing this whilst driving through the beautiful Sussex countryside (well, I’m not actually driving, Clare is! ); we’re all looking forward to a nice pint or two when we get there! Tomorrow (Thursday) we’re starting at Chichester at 9.00, then on to Canterbury at 1.00, Rochester at 2.30, and Southwark at 4.30… watch this space to see what happens! Today, day 4 of the tour, was a day of surprises. To be honest it was a day we had been dreading because of the tight schedule, but fortunately everything panned out alright in the end. Our first surprise was the journey time from Lancing to Chichester. We knew that the A27 can be a nightmare at times, so we allowed two hours… and got there in about 45 minutes! This enabled us to enjoy a leisurely cup of coffee - interrupted only by a live interview on BBC Radio Cambridgeshire - with Damian (our host of the previous night) before ascending to the triforium in Chichester Cathedral. We had originally hoped to play on the Lantern, but due to some peregrine falcons nesting there we had to stay inside. This had a couple of consequences - one was that an attempted live interview on BBC Southern Counties Radio was less successful due to poor reception, but the other was that we were able to enjoy the fabulous acoustics. We then had another first on this tour - the Dean prayed for (and with) us at the shrine to St Richard, which was most humbling. A long journey ahead to Canterbury, which we managed in little over 2 hours, ended with us being met by a couple of film crews - one is making a year-long documentary about life at the Cathedral, the other was a local ITV news channel who provided us with our first taste of live TV on the tour! Both film crews were great, but the year-long one provided our most satisfying interview experience to date, over lunch! 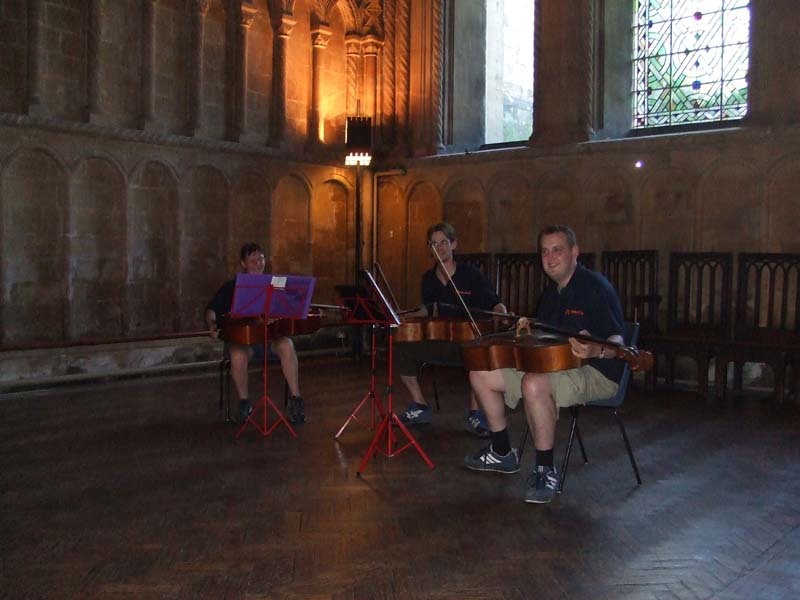 Playing at Canterbury was a real highlight - a fabulous building, but one with which none of us was too familiar, so it still gave us that sense of awe that Cathedrals can often inspire. The biggest surprise at Rochester was that there were no members of the media present! Although we are really pleased with all the media coverage we’ve been getting, and it is really helping our cause, it made a nice change just to get up onto the roof (wearing some hard hats to protect our heads from some low beams), play, and come down again! Then into London, and we made Southwark on time thanks to some great driving from James and expert navigation from Clare. A very nice surprise was that there were lots of friends (and family) waiting for us there! We gave an extended performance, including our first public performance of “I’m forever blowing bubbles” for the benefit of the West Ham fans amongst our ranks, and then enjoyed a well-earned drink or two in the Market Porter before wending our separate ways to stay with friends. Well, day 5 of the tour is complete - and we are still being followed around by this glorious weather. Today, I suppose, was a day of the Saints, with Paul, Alban and Edmund named above. Next up was Alban. St Alban's Cathedral is one of the oldest in the country, and due to its very small staircases it was not possible to get onto the roof. Instead, we played on the “Michael Stairs” - a processional staircase inside the Cathedral. We had a nice audience for that, including three people from Aspire, one of the causes we are fundraising for. Chelmsford Cathedral is not named after a Saint directly, so was the odd one out of the day. It was a great place to play, however - the top of the tower gave some excellent acoustics, and provided the local press with some nice photographs. 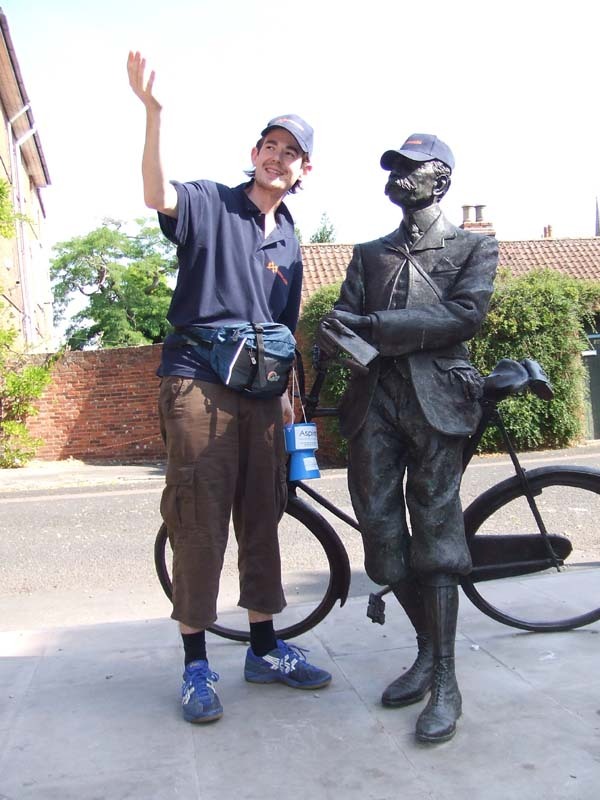 After playing there, we bade farewell to Mary Dawson, who had followed us around today up until that point, and made our way through East Anglia to Bury St Edmunds. St Edmundsbury Cathedral had undergone a huge change since any of us had last visited - an entirely new central tower had been built. This looks absolutely stunning, and although the staircase is too narrow to get cellos up, we had a fantastic view from the old Norman Tower where we played. It was nice to see Canon Michael Hampel (Precentor) again, as three of our party knew him from years ago! A very warm welcome we had there, and we finished off our day with a cup of tea & biscuits in the sacristy with clergy & vergers. Finally we drove the 40-odd miles to Norwich before settling down for an evening’s relaxation with our hosts there. We think we should be refreshed for the travels ahead tomorrow: we play at Norwich at 10.00, Ely at 12.00 and Peterborough at 2.30 - a relatively light and easy day! Highlight of day: Playing at Norwich after a lie-in! We’ve just had a comparatively easy day, supposedly, although it didn’t feel like it at times! Day 6 of the tour started with a lie-in, relatively speaking, of which we were extremely glad! Our thanks to Jo Anderson and the Tiplers for hosting us, especially within a couple of minutes’ walk of Norwich Cathedral where we started the day. Norwich was one of the three Cathedrals where health & safety regulations prevented us from playing above ground level. Instead, we gave a performance in the Presbytery, with several of Clare’s old friends (and our hosts from the previous night) in attendance. One piece of trivia we discovered about Norwich Cathedral - the weather vane is the size of a donkey. Now, perhaps that will come in useful in a pub quiz sometime… A quick photocall in the wonderful cloisters followed before we said farewell to Norwich and set off on the road to Ely. Perhaps the timings were optimistic in the first place, but the roadworks and other traffic problems certainly didn’t help. We ended up getting to Ely 30 minutes late (our biggest delay of the tour to date), and unfortunately this meant we had little time to enjoy looking at this fantastic Cathedral (above). Nevertheless, we had a superb vantage point to play from, and had a few members of an audience down below! Our first impressions of Peterborough, meanwhile, were coloured by the fiendish one-way system. We’ve struggled with a few of these in the last week - as anyone who has driven in an unfamiliar English city or large town can testify, they can be a complete nightmare - but this was the first one that appeared to actively repel our every wish. Nevertheless, we got to Peterborough just in time to ascend the tower (which had quite a few narrow and low hazards en route), play a couple of quick pieces (see right), and get down before evensong began. So there is day six. Although only three Cathedrals visited, they were three big ones! Our final drive was to Leicester where we stayed in our first B&B accommodation of the trip. Of course a visit to Leicester means we will be enjoying a curry this evening, so I will stop here to go and enjoy it! Clare and Jeremy are thinking of going for a run tonight as well, although the weather is still a little warm… we’ll have a think about that and report back in due course! It certainly won’t be a late Saturday night as we’ve got to be at the BBC Radio Leicester studio at 8.00 tomorrow morning… our only performance of the day though is at Leicester Cathedral, immediately after the morning service - about 11.45 am. I don’t know whether I’ll have the chance to update the blog tomorrow night, so if not, our next instalment will be on Monday, when we’re playing at Coventry (10.00), Birmingham (12.00) and Lichfield (3.00). As it is Sunday, I guess this is somewhat fitting, but today has been very different for us. I’ll come on to that in a moment though… first to report that last night (Saturday) Jeremy and Clare DID go for a run, around Victoria Park in Leicester . This was then followed by the promised curry before bed time! Unfortunately James and Zoe were kept awake for a while last night by some noisy neighbours, so were less than alert at breakfast time. Clare, therefore, did a live phone interview with BBC Radio Coventry & Warwickshire before we all headed into the BBC Radio Leicester studio. On to the Cathedral in Leicester , where we went to the service before playing on the roof. In the congregation there were four couples celebrating major wedding anniversaries - three golden and one ruby - which meant the service was slightly special in any case. However, we then went on to the roof to play Mendelssohn’s “Wedding March” and Bach’s “Wachet Auf” whilst the congregation enjoyed drinks on the forecourt. After a wonderful lunch at a local pub we went on to Lichfield, and James & Zoe’s flat… we’re here for a couple of nights now, so we’ve got a chance to settle a little (and for Clare to lie on the floor). However, we’re going to keep busy…Clare and Jeremy will go for a run soon, then we’re all off to the cinema to watch “Superman Returns”; tomorrow night we’ll be going to watch Sheffield Wednesday play at Burton Albion! Tomorrow, Monday, we’re also playing at Coventry (10.00), Birmingham (12.00) and Lichfield (3.00). Back to the daily routine today - although, with only three Cathedrals to perform at and just 105 miles travelled, it was a relatively easy one. We started off by leaving Lichfield at about 7.30 to allow plenty of extra rush-hour time. The traffic problems never really materialised, and we got to Coventry before 9.00 despite not being due to play until 10.00! This meant we had time for a look round the modern Cathedral (which always divides opinion), and a cup of coffee, before ascending the old Cathedral tower to play. Despite the height we were at (higher than the modern Cathedral roof), we were still audible on the ground thanks to a well-directed breeze! Then on to Birmingham, where we played inside the Cathedral - on the south gallery in the main building. We were joined by several of Zoe’s colleagues who had wandered the short distance from their office! Although playing inside is not quite as extreme in a relatively small Cathedral, we were able to enjoy a fabulous acoustic before grabbing some bagels for lunch! Our location in the Cathedral was an inside roof space, immediately above the crossing (see above). Although we were completely invisible from the nave, we could still be heard from below, and we enjoyed the acoustics and tight journey! As several of James’s colleagues - and a couple of pupils - had come along to listen, we also gave a bit of a performance outside the West door after we had descended again, which they seemed to appreciate. Back to James & Zoe’s for a rare evening of relaxation (a combination of exhaustion and the fact that the Owls were only sending a youth team meant we opted not to go to Burton Albion after all), where the promise of pizza and wine is all too tempting. Tomorrow, Tuesday, we’re playing at Derby (8.00), Southwell (11.00), Lincoln (2.00) and Sheffield (4.30). After a couple of light days, the media coverage seems to be hotting up again - and we’re back to four Cathedrals a day. So with just 15 of the 42 to go, we’re keeping our fingers crossed for our health, sanity and decent weather! Highlight of day: Appearing live on BBC News 24! Day 9 of the tour was back to the full hectic schedule of the first few days. Lots of miles covered, plenty of media coverage (including our first live national TV), and some more decent audiences (in both quantity and quality!). We started with a quick trip up the A38 from Lichfield to Derby, where we were welcomed not only by the Cathedral staff and media, but also some relatives (in the case of Zoe) and friends. Fortunately everyone was able to ascend the tower with us, and we played amongst the remains of peregrine falcons’ meals, which added a certain something to the atmosphere! The BBC Radio Derby presenter was also wonderfully bubbly, and we were bought a cup of coffee by the Dean after coming down - all in all, a great way to start the day! Next came Southwell, which was a wonderful experience. A lovely sleepy town in the Nottinghamshire countryside, it has the most beautiful Norman Cathedral set in beautiful grounds. The climb to the tower was one of the tightest yet, but the tower roof itself was fantastically spacious (see above) - which was just as well considering the number of press and TV representatives there. The view, just like that at Derby, was fantastic. We just managed to avoid a shower before being treated to lunch by the Cathedral staff - many thanks to all who helped there! Despite setting off for Lincoln after the Calendar News film crew, we somehow got there before them! As it happened, this was not such a problem, as we were greeted by a patch of very heavy rain, so we waited inside the ringing chamber before going out to play when the sun came out. By this time, the Calendar crew had caught us up, and both they and the BBC crew filmed us as we played for the crowds below! Finally we went on to Sheffield for the grand homecoming (well, temporary homecoming before setting off again tomorrow!). The weather was a slight worry, and in fact we had to do some of our performance under umbrellas held by friends and family! However, we managed to do all the various shots for the local TV and papers before going down to the forecourt and playing for a large crowd that had gathered there. This was one of the highlights of the day - seeing so many friends and family there to support us. We played a selection of our favourites for about half an hour, which seemed to go down very well. 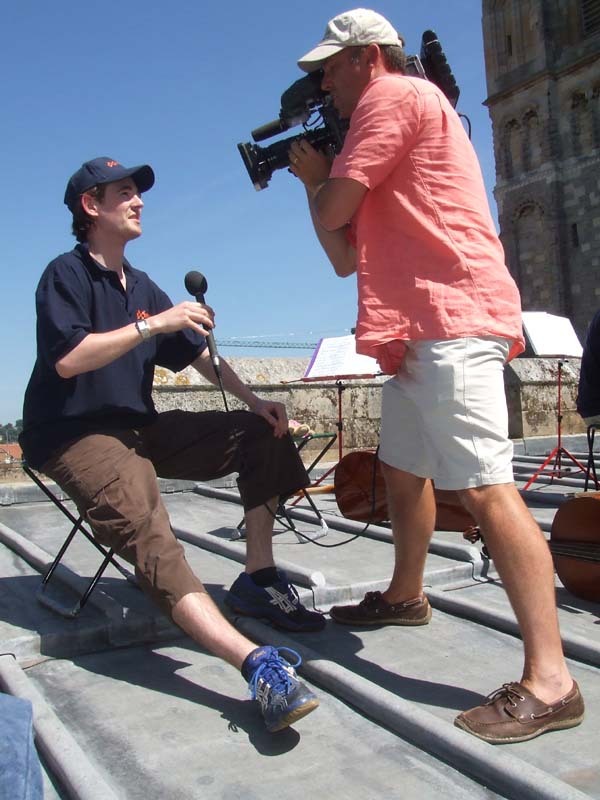 However, then we went back up to the roof… for a LIVE interview on BBC News 24! We rehearsed the interview a couple of times (see above), with a neat juxtaposition of playing and talking, before the actual slot. However, when the live bit came… just as the presenter came over to talk to Jeremy, whilst still playing, a huge gust of wind blew over his music stand, knocking into the other two cellists. Fortunately he didn’t look to his right, where James and Clare were laughing their heads off, and the interview was mostly successful! And so Jeremy and Clare finally get to spend a night in their own beds, with James and Zoe at James’s mother’s house. Incidentally, the appearance of James’s mother, Angela, means that all four party members’ mothers have now visited us en route! Three days, and eleven Cathedrals, are left… the end is in sight! Tomorrow, Wednesday, we’re playing at Wakefield (9.00), Manchester (11.00), Chester (2.00) and Liverpool (4.00). Another day, four more Cathedrals… and we got quite a variety today. Our major worry on day 10 was the weather - the forecast I saw appeared to predict blanket rain across the north for most of the day - however, we got away fairly lightly! We started by leaving Sheffield at 7am, beating the traffic to get to Wakefield just before 8.00. We have got ourselves into a routine of getting to the first stop of the day early, enabling both an avoidance of rush hour and a morning cup of coffee upon arrival, so we were pleased to see a branch of Costa Coffee immediately opposite the Cathedral car park! Across the Pennines to Manchester (above), where we certainly did have media present. Three film crews and two photographers (although no radio) saw us play a few tunes, and give a few interviews, whilst the rain almost held off (but a few small spots found their way down, curtailing the performance slightly). But another lucky escape on the whole. We made good progress towards Chester, so we stopped for a slightly naughty Wimpy lunch at Chester services before heading into town. We got a very nice surprise there - not only did the rain still hold off, but our location was nicer than we had imagined. It was the roof of the monastic cloister, which despite being on the same level as Abbey Square, looked down onto a beautiful cloister garden in which had gathered quite a crowd. This crowd included a couple of James’s school pupils, who had travelled (with parents) up from Staffordshire - top marks for that effort! Finally on to Liverpool, where we played from the top of the main tower. This was the highest point of the tour (about 500 feet above sea level, 320 feet above ground level), and the BBC TV crew took good advantage of that. Our time on the tower also included a live radio interview on BBC Radio Merseyside - which, we discovered, was the interviewer’s first live interview. It was a strange experience being more experienced at live interviews than the person posing the questions, but we think that both she and we did well! When we descended from the tower, we were given the opportunity to play on the bridge that crosses the Nave (see above) - a wonderful setting, and it gave us the opportunity to play in the extraordinary acoustic that is Liverpool Anglican Cathedral. This was a wonderfully serene way to end the day’s playing. Now we’re off to Warrington to stay the night with friends of Clare’s, and pray for more luck with the weather tomorrow! We’ll be starting the day with three live radio interviews (BBC Radio Lancashire, Leeds and York ), before playing at Blackburn (9.00), Bradford (11.00), York (1.00) and Ripon (3.00). We’ve covered a lot of ground in a short space of time today! From Warrington to Durham via the four Cathedral cities listed above… quite a challenge for day 11. But I’m pleased to say we met the challenge head on! After leaving our hosts (thanks to Shaun and Miriam for a fantastic meal and comfortable night… and some lego to keep James’s obsession with sheds satisfied - see right), we went up to the Radio Lancashire studio in Blackburn to do two interviews. The first, live in the studio on Radio Lancashire, was great; the second, with BBC Radio Leeds via ISDN went well too, although we were slightly bemused by all the talk of squirrels just before we were on! 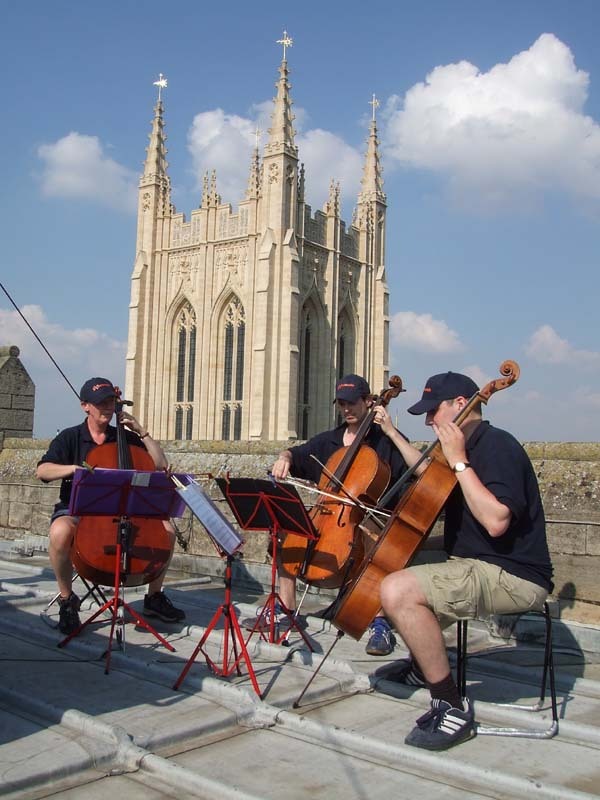 We were joined up the tower in Blackburn by a few members of the congregation, including two cellists, so we gave them a couple of pieces before dashing off to Bradford. This really was a rushed day, so we were in and out quickly at Bradford too. It’s worth mentioning, though, that the Blackburn access was particularly tricky… narrow staircases, three ladders, low beams and small trapdoors all involved! The staircase at Bradford was a doddle in comparison, but was still tight in places. Up the A1 to Ripon we went, still without catching breath since leaving Warrington at 6.45 in the morning, and we got the Cathedral in plenty of time for our 3.00 performance. 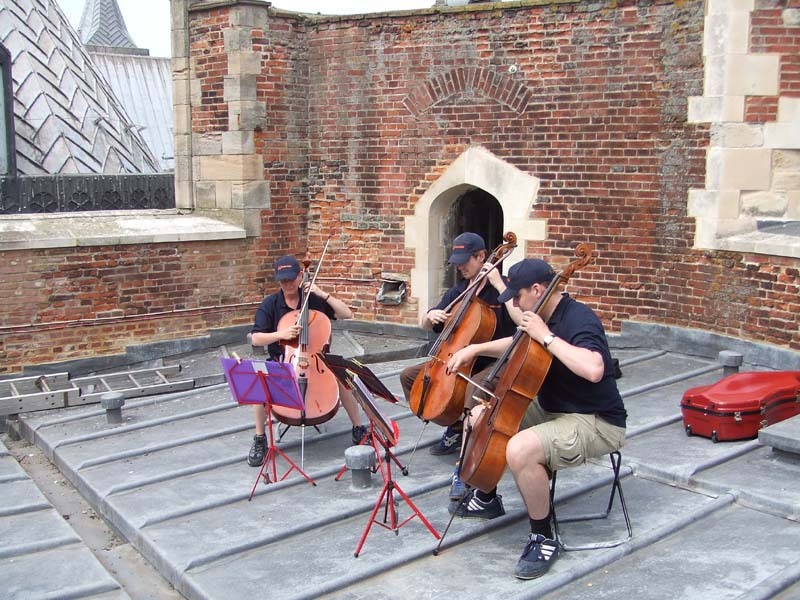 After playing a few numbers on the library roof, we went down and gave another short “recital” in the Cathedral itself for the benefit of all the visitors. This was a really special way to end the day’s playing, before having a cup of tea and cookies… many thanks to Dean the verger for looking after us so well! Finally, we have come up to the North East to spend the night in Durham. This is particularly special for three of us, as we were at University here… we’re already enjoying the serenity, and are looking forward to visiting some old haunts this evening! And so, the end is near… tomorrow, we’ll be doing our final three Cathedrals of the tour. We can scarcely believe it’s gone so quickly (even if our bodies are telling us we’ve been going non-stop for 12 days). We’re finishing off at Durham (10.00), Newcastle (12.00) and Carlisle (3.00) - and then back to Sheffield! Highlight of day: Durham - everything about it! Wow. I can’t believe it’s all over, and I can’t believe it went as smoothly as it did. 12 days, 42 Cathedrals, almost no rain, virtually no traffic problems, lots of sponsorship (although more is always welcome! ), and lots of media coverage. Let’s start the story of day 12 with the news that we got a lie-in! After several days of rising at 6am, we didn’t have to get up until eight today, meaning that the discovery we had a colour picture on page 13 of the Guardian was even more welcome! We spent a fair amount of time at Durham, which was very special to us. We knew we would see quite a few familiar faces (some are in the picture above), but it was an extra special surprise for Clare to see her old friend Joanne Rutter, and her son Nick, who had driven up all the way from Cambridgeshire especially to hear us! As well as playing a few pieces from the North West tower (amongst the pigeons, and their assorted detritus), we spent quite a few minutes doing pieces for Tyne Tees TV as well as various newspapers and radio stations, before heading down for coffee & cake courtesy of the Cathedral. We were delighted to discover that we had been audible not only from the ground, but from the top of the central tower, and that the good folk of Durham had been very generous with their sponsorship as a result! This was no doubt helped by the fact that Rt Revd Professor Stephen Sykes (who had preached at James & Zoe’s wedding) had organised his delightful granddaughter to aid the collection! Bidding a fond farewell to Durham, we headed up the A1 to Newcastle, where we played from the main nave roof. This gave us a fabulous view of the city, and of some of the new buildings lining the River Tyne. We sat astride the apex of the roof in a line (see right), which I think added something for the photographers who were present - and we had several office workers leaning out of windows to hear us too! After a quick sandwich, we headed back West for the final time, to play at our final destination - Carlisle. Unfortunately, due to the Morland Chorister Camp taking place at the Cathedral this afternoon, we were unable to play on the roof, or even inside the building. Instead, we played outside the East front of the Cathedral, which meant we were close to lots of passing shoppers, and everyone could get very close to us! Although it wasn’t the most extreme way of finishing the tour, it was a pleasant way to round off proceedings.